Direct light, right into your eyes may give the impression of a well lit place, but it really blinds us and is not very beneficial for our eyes. To prove it have a look right into the Sun. Our eyes are designed to see an indirect light bounced off objects. 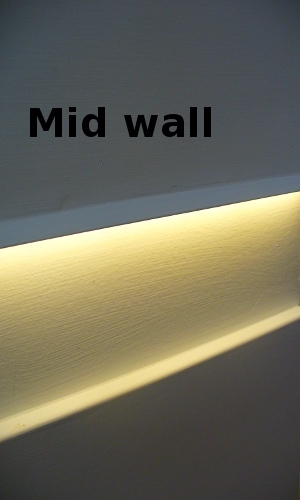 This effect is used very successfully in LED Strip / Tape cove lighting. 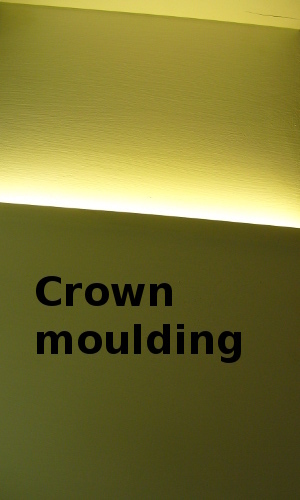 Use of the LED Strip / Tape spreads from the cove lighting located above the crown molding to the lighted LED Strip / Tape located in the middle of the wall height or the baseboard lighting. White or light painted ceiling and the room walls will bounce off more of the light supplied, and in turn will require much less light and electrical energy supplied to keep required levels of comfort. Not all the LED Strips / Tapes are created equal. The light created by LED pearls comes in different white light colours and luminosity. The Green Electrician follows new developments of the LED Strip / Tape market and is in the position to successfully use it for General Lighting or Accent Lighting in Toronto, Mississauga, Etobicoke, Oakville, Brampton and GTA. 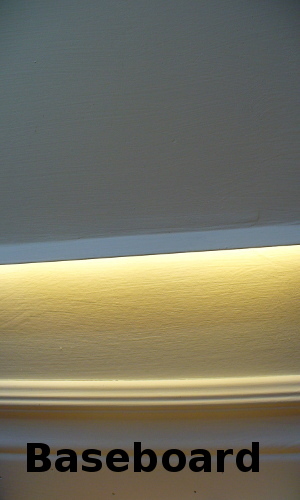 Just a few examples of the LED Strip / Tape used by The Green Electrician are pictured above. LED pearls ( SMD for Surface Mounted Device ) of different design and properties are: SMD3528, SMD5050 and SMD2835. Over the ages people kept room walls light coloured. It was Victorian England and the parallel European styles of the time, who began to cover walls and ceilings with dark colours to mask the soot coming from the fireplaces, candles, kerosene and gas lamps used then as light sources. In the 21st century we can afford to efficiently manage our light systems and live in a well lit and clean indoor environment at the same time.